Part two of a few of my favourite things from 2014, (see here for Part 1); this time Feminism, Diversity + Inclusivity, Bangladesh, and All-women lists. I've been coming across articles highlighting 2013's greatest feminist moments - this 28 Most Iconic Feminist moments of 2013 for example, or the 25 best moments for women in 2013 - and while they have some brilliant moments included, I couldn't help but notice that they're very US-centric . Surely the majority of 2013 feminist wins didn't happen in the US alone? Well, no - feminism is alive and kicking in the rest of the world too, and here's ten examples highlighting just how. In September, Aminata Touré became Prime Minister of Senegal. True to her unique style, she even announced her new appointment herself. Former Justice Minister, she's known for her strong anti-corruption stance, and has had an impressive career as a human rights activist. And let's not forget; Malawi and Liberia also have female heads of state - Joyce Banda and Ellen Johnson Sirleaf, respectively. Being sampled in Beyoncé's track “Flawless”; probably did wonders for Adichie's popularity among a whole new audience - it's well deserved, though. A related feminist win - her latest book, Americanah, came out earlier this year. Highly, highly recommended. In Rwanda, women won 64% of seats in Parliament. 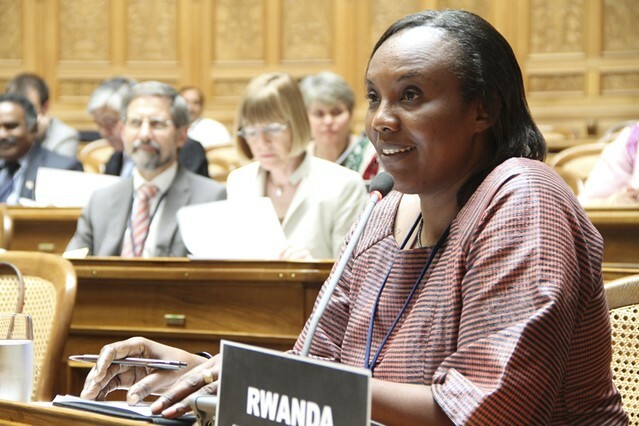 Rwanda beat their own record of percentage of women in parliament – jumping from 56.3% to a massive 64 per cent of women earlier this year. Aged 18, Mayam Mahmoud got through to the semi finals of Arabs got talent; she encouraged people to look past her veil, and listen to what she's rapping about. Written and directed by Haifaa Al-Mansour, Wadjda (Arabic: وجدة,) was filmed in the streets of Riyadh, meaning that the director had to work from the back of a van to avoid publicly mixing with men working on her crew. The film- the first feature film to be shot entirely in Saudi Arabia, was also the country's first official submission to the Oscars for the Best Foreign Language Film. Listen to Haifaa Al-Mansour talk about the challenges she faced, and changes happening in Saudi Arabia here. 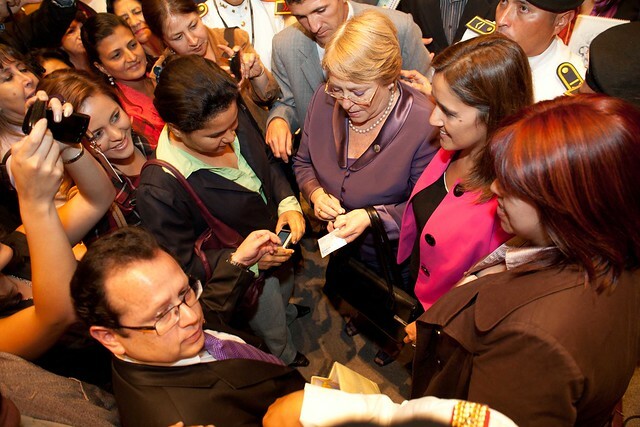 After huge efforts by Colombian women's groups working to highlight the key role of women in peacebuilding, Colombian President Juan Manuel Santos finally announced that women would be invited to join the negotiation team. María Paulina Riveros y Nigeria Rentería Lozano, both lawyers, joined the previously all-male team at the end of November 2013. Despite being a continent known for “machismo”, there are now women leading Argentina (Cristina Fernández de Kirchner), Brazil (Dilma Rousseff), Costa Rica (Laura Chinchilla), and most recently Chile, following Michelle Bachelet's overwhelming win with 62% of the vote earlier this month. No implied endorsement of any of their policies, though! This video, mocking Saudi Arabia's ban on letting women drive, hit 10 million views earlier in the year. Here's hoping some of the princes saw it too. “Improvements in the survival of infants and children under 5 years of age, life expectancy, immunisation coverage, and tuberculosis control in Bangladesh are part of a remarkable success story for health [in Bangladesh]. In September, Huriya Mashhoor, the Minister for Human Rights in Yemen, called for the revival of a bill which would set the legal minimum age for marriage to 18 years old. Her decision came after international condemnation following reports that an 8 year old died of internal bleeding on the night she married a 40 year old man. 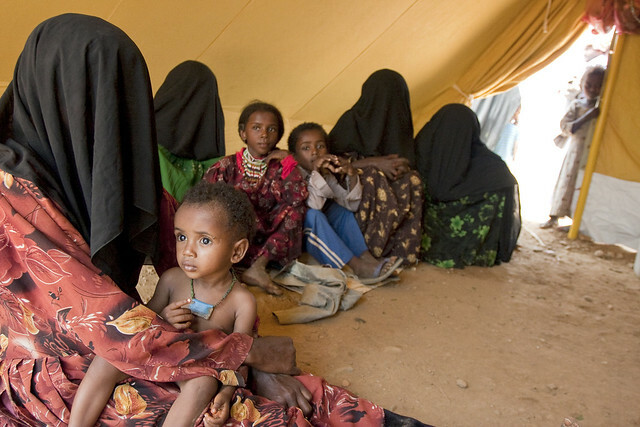 Though no further progress has been reported, in November this year, Yemeni police stopped the wedding of a nine year old girl; it was reportedly the first such intervention to stop a child marriage in Yemen. 1 Suggestion: consider adding “from the US”; on to the end of both of those headlines, to avoid over-reduction of the global feminist movement. * Not strictly 'majority world' countries - but ones where improvements in women's rights are thoroughly needed, so I've included them here. The strikes and violence in Bangladesh have been continuing, and as ever, it's been frustrating and annoying to myself and my family, but we're the lucky ones. To millions of others, it's been life-altering, in the worst of ways. The instability and insecurity that politicians are bringing to every day life is pushing people living on the breadline to their very limits, and most probably, beyond, with potentially irreversible consequences. For those who are already living precariously, in a space where they don't have savings, where they make just about the right amount of money to pay their rent (if they have regular shelter), and pay for their food, or for their family, the sudden halt in their income due to the strikes must be turning their lives upside down. There has been no notice given of when strikes might happen, and no indication of when they might stop. These utterly random strikes, called on politicians' whims, are having drastic effects on the economy in many ways. Drivers aren't needed when cars can't go on the roads; rickshaw-wallahs aren't needed when nobody's going outside; shop workers aren't needed when shops are closed. City-wide blockades stopping everything coming in and out of Dhaka have led to ports being overfull, deliveries not completed – factory workers aren't needed when materials can't get in, or out, of the city. Worst of all, people who live on the streets and earn their living in more informal ways - selling food on the streets, or making artisanal items to sell, for example - those who are already at the very edges of society, are being pushed even further towards the edges of extreme poverty. So as a result of the strikes, millions of people, and their families, have found themselves without any source of income. It's easy, and probably more convenient, to think of this as a “developing world” problem. People starving because they can't afford food, or selling their few belongings as a last resort. But how many people living in “developed countries” would be able to cope in a similar situation? Would you? Picture it: one day, you're told not to come into work, and you know that you won't get paid until further notice. You have no idea when this further notice might be. Add to that limited supplies of, well, everything (food, cash in the ATM, vegetables, fruit) - and, as the cherry on the cake, you're advised not to go outside, use public transport or drive your car, if you happen to have one, because, rumour has it, people are being paid on the streets (by political parties) to throw grenades and douse vehicles in petrol. I would guess that anywhere in the world, a high proportion of people would be left in much the same situation as the millions of Bengalis here who have been put in this situation. The difference between us: call me naive, but I'd hope that other democratic nations wouldn't dream of doing this to their citizens. 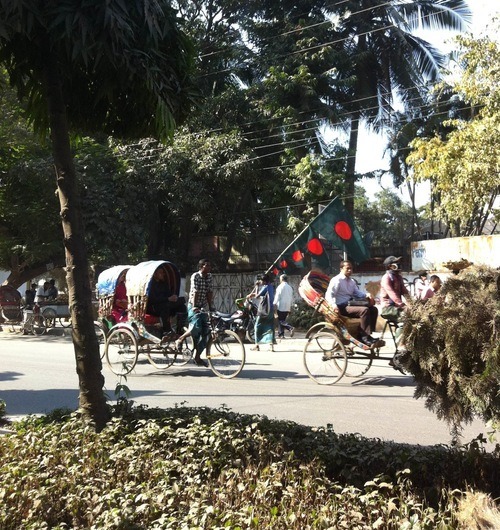 People living in precarious situations isn't by any means exclusive to Bangladesh, but currently, the instability and insecurity that they face really is. Saying there's a lack of social security here doesn't come close to covering it – it's not just that the government aren't providing social security, it's that they are the ones who are actively putting people in a situation where they will, without a doubt, be needing it, while doing nothing about it. When I first arrived, I was a little shocked at how people didn't seem to understand when I described one aspect of my work – helping citizens hold government accountable. Now, I see why. Right now, there's really no link whatsoever between what the population needs, and what the government, and other political parties, are doing here. If anything, politicians' actions over the past few weeks have brought only suffering to 99% of the population; this is anything but a democracy, and sadly I'm almost certain that the upcoming “elections” will prove that more than ever. The human cost of "hartals"
The strikes and blockades going on at the moment in Dhaka have been, to say the least, disruptive to people's lives, and they show no sign of slowing. The economic cost has been huge, the social cost too, and all of this is indicative of the political chaos in the country leading up to elections, due to take place on January 5th, 2014. But there's a key part of the debate that's missing; the human cost, and the reasons behind it. As friends in Dhaka confirm, these strikes have been the bloodiest and most violent ones yet, with people being killed or seriously injured almost as a matter of course. This in itself should be enough to stop them being referred to as hartals, which began life as part of Gandhi's civil disobedience movement against colonialism. Employing the word hartal for today's situation seems nothing short of disrespectful to Gandhi, whose form of non-violent protest changed society. And can anything be civil disobedience when it is organised by the authorities, with only the citizens suffering the consequences? I would be curious to know what people think they are striking against, when they go out onto the streets of Dhaka later today; because to me, it feels like nobody knows, we're just sitting out a high-level political game. But what actually is the aim of the game? There's no real social protest movement behind them; strikes are simply called by political parties, seemingly randomly. The only consequence, right now, is disruption to every day life, but only for the people who live an every day life. For those calling the strikes, I'd imagine their days continue much as normal. Of course, all intentional killing is senseless. But this seems a step up (or down?) from that; the people who are dying in these strikes aren't people who chose to give their lives for a cause, because there isn't a cause. They are people who decided to go to work that day, maybe because they wouldn't be able to eat if they missed out on yet another day's income; people who decided to take that bus ride to visit their family, to get out to their village for the weekend, or simply people who wanted to move around the city in their car. And they aren't just 'being killed'; people are actively killing them- so let's stop using the passive to express actions as terrible as these. The 14-year-old who “died of serious burns” didn't somehow self-combust, he had a petrol bomb thrown on the van he was in. 8 year old Sumi who died in a bus didn't just die – people set the bus she was in on fire, while she was in it. The 8 people who died in Matuail last Tuesday wouldn't have suffered and died from burn injuries if others hadn't thrown petrol on the bus they were in first, then set it alight; and sadly, there are many more stories like this. It's this, more than anything, that I can't understand. Whatever the political games going on, it takes real people to carry out these despicable and senseless acts of violence. Perhaps they're being paid to take part in the strikes; but even so, I can't believe that they would get paid extra to kill innocent bystanders. Where did our sense of morality, in the most basic of senses, go? Especially in a country that has suffered, dare I say it, more than most at the hands of others; when did we turn upon ourselves? This isn't about tribal loyalties, or religious beliefs, or even political beliefs; those dying in the violence here most likely haven't expressed loyalty to any political party, they just happen to be outside on the wrong day. They didn't leave the house with the resolution that they would fight for their beliefs and maybe even die for them; how could they? There's no moral fight being fought here. In other protests that I've seen or followed where there is an element of danger, there is always a point of decision for the person taking part. The point of no return, where you know that if you go outside and take part in what you're doing, there's a chance you might not come back; but you choose to go because you believe in what you're doing, and you believe it might change the world. But this? What is this? The people who are dying here weren't allowed even that terrible choice. The people who are murdering others aren't killing for a reason, however twisted that reason may be; they're just killing, in the most banal of senses. In past years, people would be allowed to leave the buses, or the cars, or the rickshaws, before they were set alight; now it seems, they aren't even permitted that. While we might complain about the strikes and the inconvenience they cause, and analysts might look at the economic losses the country is facing, just remember that the worst consequence of all of this is caused by us, not by squabbling politicians. We, Bangladeshi people, are the ones who are killing our fellow citizens; without rhyme nor reason, with no gains, only losses. If you're playing an active role in strikes to gain a bit of money in a time of need (ironic, then, that if the hartals weren't taking place, you would be able to go back to your normal job) – even if you're just taking part in the strikes for want of something to do – whatever your reasoning, just stop, and think about what you're doing, or about to do. In other words; we need to find that morality, and fast. For more reading on hartals, check out this report by UNDP Bangladesh from 2005, “Beyond Hartals”; - sadly, many of the points are still extremely pertinent. The garment industry in Bangladesh - exploitation, or empowerment? Last week, by a massive stroke of luck, I had the chance to meet Professor Mohammed Yunus, together with Transparency International founder Peter Eigen, talk about a new initiative of theirs, the Garment Industries Transparency Initiative. Details of the initiative are still being worked out, but it was Professor Yunus' speech about the effect that the garment industry has had on Bangladesh that left me thinking. The story we've all heard is one of exploitation. Especially since the recent and tragic factory collapse at Rana Plaza, which left over 1,100 people dead, hundreds still missing, and devastated the lives of thousands more – injured survivors, dependent family members, and those in mourning, there are (justifiably) negative connotations that come with any item 'Made in Bangladesh'. Numerous poverty indicators show that “Bangladesh has had disproportionate poverty reduction for its amount of growth” including life expectancy increased by 10 years (4 years longer than Indians), infant mortality has more than halved, and literacy rates have almost doubled, since 1990. According to the World Bank, 16 million people were lifted 'out of poverty' in the last 10 years, with labour income as one of the major factors. It's difficult to comprehend how these awful working conditions could bring anything other than unhappiness to those involved – but actually, for millions, the garment industry has been a source of empowerment and social advancement. Professor Yunus made the strong argument that actually, the garment industry has been a catalyst for positive social change in the country. It has, in an otherwise traditional culture where women play the role of housewife and mother, and men are the breadwinners, provided a culturally acceptable alternative. This opportunity for employment has provided millions of women with their one opportunity to leave their village, to earn their own living, and even to send money back to support their family. That is, in effect, the definition of empowerment. The conditions, however, are the epitome of exploitation. The challenge now is to keep the first, while getting rid of the second. Pressurising companies to leave Bangladesh and stop employing these women is not the solution – this leaves them again with nothing. Professor Yunus' point was that the global community should encourage foreign companies to keep investing in Bangladesh, while improving working conditions for the workers, not simply giving up on them. So what does that mean for us, the consumers? We could try and hold companies accountable for their actions. We could ask them to be transparent about where they are sourcing their clothes from. Or, if the Garment Industries Transparency Initiative goes ahead as Mohammed Yunus and Peter Eigen suggested, we could pay an extra dollar or two to make sure that the clothes we are buying were not made with slave labour. I've been looking for some books to read about Bangladesh for a while now, both fiction and non-fiction, so when a discussion about books covering the historical and political context of the country came up in an online group, I wanted to make sure these great suggestions didn't get lost. Freedom From Want: The Remarkable Success Story of BRAC, the Global Grassroots Organization That's Winning the Fight Against Poverty by Ian Smillie - very difficult to find to buy online and not available on Kindle, but if you happen to be in Dhaka you can find it on sale at branches of Aarong. Unaccustomed Earth by Jhumpa Lahiri - Reading this brought the most “that happened to me!”; moments I've ever had in a book . It's a collection of short stories, many around families from Bengali backgrounds living in the US or the UK. Highly recommended! The Good Muslim, by Tahmima Anam - the sequel to A Golden Age, this focuses a lot more on the role of Islam within the family we see in The Good Muslim. Any other suggestions, tweet me @zararah! I just finished reading Mohammed Yunus' first book about the Grameen Bank, 'Banker to the Poor'. I'm starstruck, and impressed, and in awe, of the incredible work he's done. He took an idea and turned it into real, concrete action, having positive effects on millions of people's lives, in a tough environment to work in. Identifying that women were the key change makers in families living in extreme poverty made a huge change, too. At least in Bangladesh, it is/was traditionally the man's role to deal with financial matters for the family; subverting this trend has proven to be a great success, and the associated issues of men feeling threatened by their spouses' newfound 'power' is also dealt with in the book. 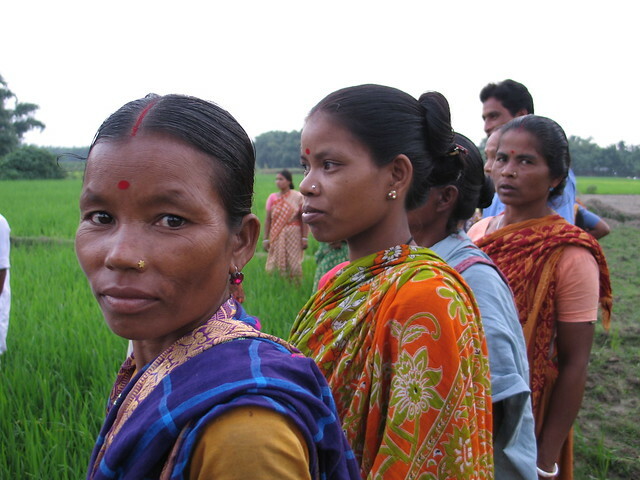 Receivers of loans from the Grameen Bank are 97% women, and the bank is actually owned 95% by its borrowers. Information and communication technology is raising the hope that we are approaching a world which will be free from power-brokers and knowledge-brokers... Any power built on exclusive access to information will disintegrate. Any common citizen will have almost as much access to information as the head of government. Leadership will have to be based on vision and integrity, rather than the manipulation of information. This book was written in 1999. Nearly 15 years later, these predictions haven't come true, but they should have. In part, I was thrilled to see that the the basic message of the organisation I work for, the Open Knowledge Foundation, is/was shared by Mohammed Yunus; but isn't it sad that we need to be actively campaigning and working towards a world free of 'knowledge-brokers', as he puts it? Shouldn't it have justhappened naturally? Happily, the tide is beginning to turn, thanks to the incredible open movement across the world, but Yunus' hope that 'any common citizen will have almost as much access to information as the head of government' is still a long way off. Easy access to credit, and easy access to a global network of information for the poorest women and men anywhere in the world will eliminate poverty from our planet more surely and speedily than anything else will.